polish insomniac: Attention Nail Art Fans! Enter the It's So Easy Nail Art Contest! Attention Nail Art Fans! 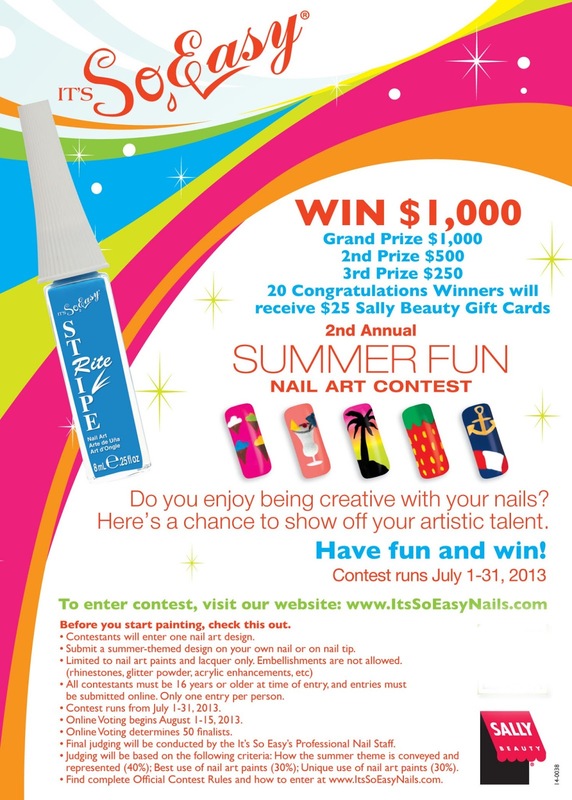 Enter the It's So Easy Nail Art Contest! Twenty congratulations prizes will also be awarded, offering $25 gift cards to shop at Sally Beauty Supply, the largest retailer of professional beauty products in the world. So yes, you want to enter! To enter, participants must visit www.itssoeasynails.com and upload one nail art look. The deadline to enter is Wednesday, July 31st. On August 1st, online voting will open to nail enthusiasts to help their favorite design win. Voting ends on August 15th and will determine the top 50 finalists. Final judging will be conducted by the It’s So Easy Professional Nail Art Team, and winners will be announced shortly after. Participants must be 16 and older to enter, and entries are limited to nail lacquer and nail art paint only - no embellishments allowed. Tag the It’s So Easy contest on Facebook, Instagram and Twitter using #ISENailArtContest2013. Since I totally lack any nail art skills, I will need to live vicariously through you! I would love to see pics of your entries! Tweet me at @jbrobs!